Stability describes the current log market (unusually). Whilst there are fluctuations in various economic drivers, the net effect is little change in price and demand. The NZX Agrifax Combined Log Price Index which measures returns from the whole forest remained unchanged in October at $74/tonne. Domestic log demand and prices remain steady. Improved lumber prices in the US and Asia are being offset by the strong NZ$. Market conditions are showing signs of improvement in Australia and New Zealand as the housing market sees increased activity. The Korean economy is maintaining its export-led recovery. NZ Radiata pine log prices are now on a par with China and more NZ log volume is going to this market. This will lower volume pressure to China as increased summer harvesting volumes come to market. A competitive Korean market should also underpin China log prices, which are getting high in comparison to the alternative domestic, Russian and North American logs. Since January of this year, A-grade logs in China have increased from US$80/JAS m3 CFR to the current US$115. However, much of this price increase has been off-set by the increase in the value of the NZ$ and higher ocean freight rates. But don't hold your breath for a NZ$ at-wharf-gate price spike if the NZ$ or the ocean freight rates plummet. Each of these developments would immediately put downward pressure on China CFR prices. Log export volumes for the June to August 2009 quarter were 33% higher than the same period last year, and 45% above the five-year average for the same period. Pacific handy-size fixtures (setting the ocean freight rate for NZ logs to Asia) have remained steady of the past couple of months, at the relatively high levels of around US$43/JAS m3 spot basis. This trend is somewhat at variance to the Baltic Dry Index which saw the index reduce from June through September. Low levels of inbound cargo, loss of some vessel capacity and high vessel demand from NZ shippers has contributed to supporting higher rates in this segment of the market. 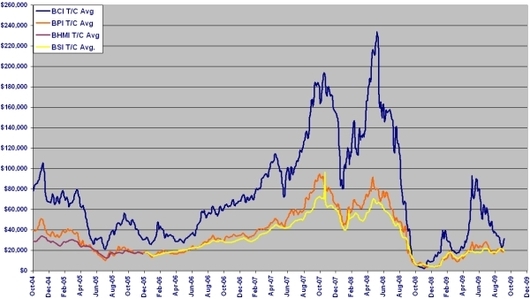 Chart showing average time charter rates for Capesize (blue), Panamax (orange) and Supramax/Handymax (yellow) vessels. The yellow line is most relevant to vessels that carry NZ logs for export. The outlook appears to be a global growth story. If aggregate global growth continues to advance from the lows precipitated by financial crisis, ocean freight rates are likely to stay at least at current levels. Some increase in NZ demand for bulk commodities may increase inbound cargoes such as fertiliser and have some downward pressure on rates, but this isn't expected to be significant.